At simplyEstate we understand how difficult the time after the loss of a loved one can be – we send you our condolences. The time needed to deal with a loss is often interrupted by the immediate necessity for funeral planning and deceased estate administration. The administration surrounding a death can be overwhelming at first and not everyone can or wants to afford full support which can cost thousands of Dollars. 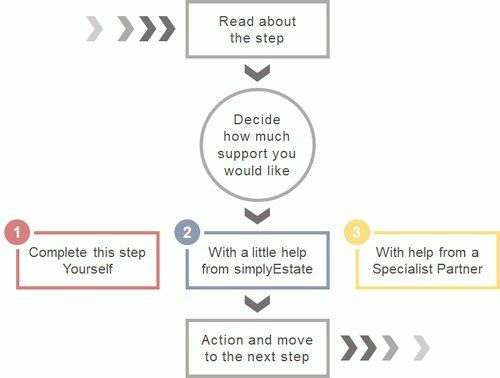 This is why simplyEstate – Australia’s first deceased estate administration platform – was created. It allows Executors, Administrators and Next of Kin to work through the deceased estate administration online, from anywhere and anytime. simplyEstate would be happy to support you through the deceased estate administration process in the simplest possible way. Please contact us via email or book your free first phone appointment if you wish to speak to us – we’re here to help. simplyEstate provides Executors, Administrators, Next of Kin and Beneficiaries with the most common information after a loss in one place, online and for free. The Process Guide allows you to work through the deceased estate administration process in your own time and in a structured way. You have full control and decide at each step how much you want to do yourself, if you want support from us or from a Specialist Partner close to you, anywhere in Perth, Sydney, Melbourne and Brisbane. Answer a few simple questions to help us find out where you should start by clicking on each answer.
. Click the button to be redirected. Find out more by clicking on the relevant topic. If you’re still unsure, book your free first phone appointment and we will help you work out where to start. simplyEstate’s online Process Guide helps Executors, Administrators and Next of Kin navigate through the deceased administration process step-by-step. simplyEstate’s Checklists & Tools assist you when working through the estate administration. You can review all available and only pay for the ones you think are most useful. simplyEstate’s Phone Appointments allow you to discuss the deceased estate administration. We will provide general guidance but not specific advice as per our Terms & Conditions. simplyEstate is a social enterprise with a vision to be Australia’s number one platform for estate planning and administration. We want to educate families about and simplify the deceased estate administration process. simplyEstate aims to provide clear guidance when navigating the deceased estate administration and demystify some of the fears and complexities. We want Australian families to be confident when administering an estate, engaging with our carefully selected Specialist Partners across the country and dealing with all types of organisations. A loss of a loved one can be one of the most confronting and difficult times and our mission is to provide everything needed to administer an estate in the simplest, cost and time effective way. Copyright © 2018-2019 simplyEstate Pty Ltd. All Rights Reserved.